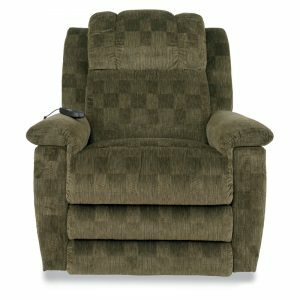 LA-Z-BOY Gibson Reclina-Rocker Recliner. Tufted enough for you? As if the billowy back and extra-padded seat aren’t reasons enough to make the Gibson Reclina-Rocker® yours, plush pillow top arms and its grand scale will be. Now with the PowerReclineXR option that gives you the power to independently adjust the back and leg rest at the touch of a button to any combination of positions for virtually endless relaxing possibilities. Available in a wide selection of custom fabrics and leathers. See the complete Gibson line for more reclining options and additional matching pieces. LA-Z-BOY Gibson Reclina-Rocker Recliner. Tufted enough for you? As if the billowy back and extra-padded seat aren’t reasons enough to make the Gibson Reclina-Rocker® yours, plush pillowtop arms and its grand scale will be. Now with the PowerReclineXR option that gives you the power to independently adjust the back and leg-rest at the touch of a button to any combination of positions for virtually endless relaxing possibilities. Available in a wide selection of custom fabrics and leathers. 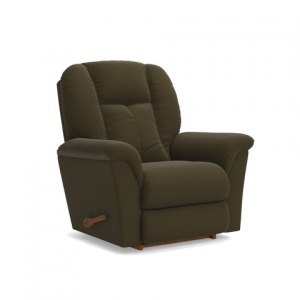 See the complete Gibson line for more reclining options and additional matching pieces.